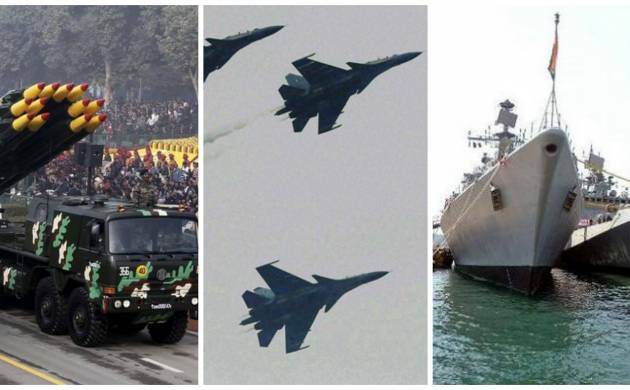 A “joint doctrine” providing for deeper operational synergies among the army, navy and air force was unveiled on Monday with an aim coherently deal with all possible security threats facing India including conventional and proxy wars. The document listed a range of security threats facing the country including transnational threats, “proxy war” in Jammu and Kashmir and left-wing extremism in various parts of the country and indicated that “surgical strikes” could be a key feature in counter-terror operations. “India has moved to a pro-active and pragmatic philosophy to counter various conflict situations. The response to terror provocations could be in the form of ‘surgical strikes’ and these would be subsumed in the sub-conventional portion of the spectrum of armed conflict,” it said. The doctrine will facilitate the establishment of a broad framework of concepts and principles for joint planning and conduct of operations across all the domains such as land, air, sea, space and cyber-space.The document was released by chairman of the chiefs of staff committee (COSC) and Navy Chief Admiral Sunil Lanba in presence of Army Chief Gen Bipin Rawat and IAF Chief B S Dhanoa. Referring to evolving security situation in the region, it said India’s strategic interests along the Northern, Western and Eastern borders and sensitivities along the Line of Control (LoC) and Line of Actual Control (LAC) will have to be protected with effective deterrent capabilities. “Maintaining territorial integrity and preserving national sovereignty continues to remain a major strategic challenge for India,” the document, a second edition of the joint doctrine, said. The first edition of the document was released around eight years ago. It said India’s threats primarily emanate from the disputed land borders with certain neighbours and that the need to address consequences of instability and volatility in parts of India’s extended and immediate neighbourhood remains a priority. “Transnational threats posed by the activities of State and Non-State sponsored terrorist organisations are exacerbated by the dynamics of intra and inter-State conflicts which pose a danger to regions beyond our primary theatres,” said the document. The doctrine also talked about the steps initiated for establishment of the ‘Defence Cyber Agency’, ‘Defence Space Agency’ and ‘Special Operations Division’. The layered hierarchies of the national security structures should integrate to get the most out of the expertise available,” it said. India remains concerned about the presence and role of external powers in the Indian Ocean Region, adding security challenges are exacerbated by several countries vying to acquire Weapons of Mass Destructionix (WMD). “The fragile security environment in the Af-Pak region and neighbouring support to proxy war in Jammu & Kashmir, lends a possibility of it being a conduit for eastward spread of fundamentalist and radical ideologies,” said the document. The doctrine said having an ‘Integrated Theatre Battle’ to ensure decisive victory in a network centric environment across the entire spectrum of conflict in varied geographical domains, will be the guiding philosophy for evolution of war fighting strategies. “The Joint Operations Committee (JOCOM) is the integrated structure at strategic level under the COSC to conduct and plan operations,” it said. The doctrine said to achieve ‘jointness’, it is essential that personnel from the three services serve together in organisations across the military-strategic, operational and tactical levels.